New! Pelikan – Pens now with patented cap backup. This fountain pen is equipped with a new cap backup. Please screw the cap off. You will hear a click and feel a small resistance as when screwing on the cap. This cap secures against coming loose from the barrel, even if you have forgotten to firmly screw on the cap. The resistance that I described halfway through screwing or unscrewing the cap which needs to be overcome for removal or replacement of the cap is there by design. I don’t believe that it was a marketed or widely publicized feature nor do I believe it was ever officially named/trademarked. I refer to it as the secure locking cap. The mechanism is actually a safety device which was employed on the 120, 140, and 400NN circa 1958. The resistance provided a way to prevent the unintentional uncapping of the pen. One of the nice things about the Pelikan cap is that even though it is a screw-on cap, it can be removed and replaced quickly due to the threading. This has the unfortunate side effect of a pen occasionally coming undone in the pocket if the cap is not secured tightly. This secure locking cap does indeed protect against that. I guess that the feature wasn’t widely appreciated as it did not seem to expand into other models or be incorporated for very long. 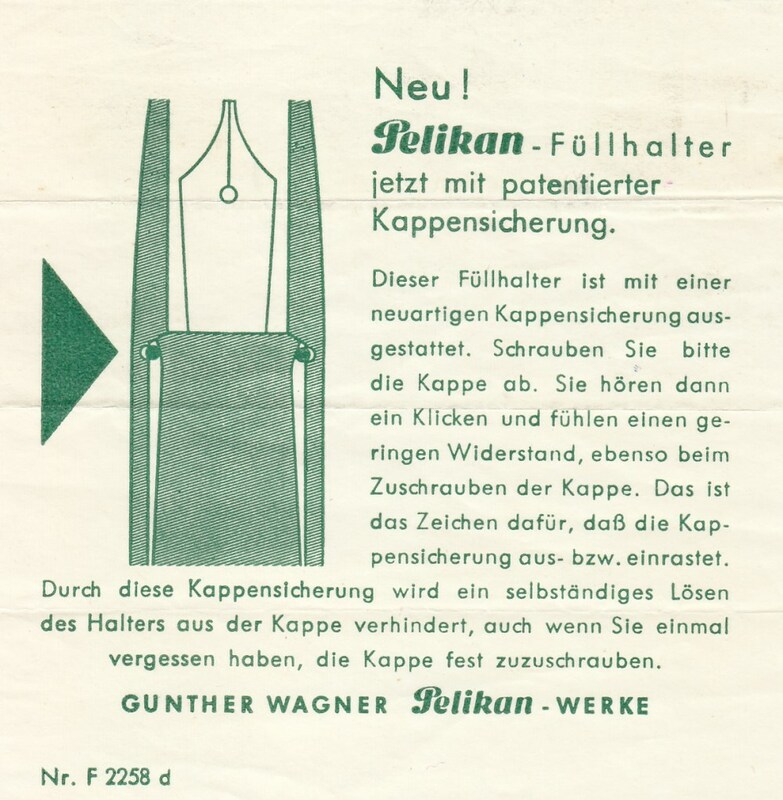 Post Updated 9/23/15: Added a German notice of the secure locking cap feature. « Merz & Krell – Who Were They? I thought it was a defect! I recently purchased an all green Pelikan 140. As you know, these vintage pens can be worn almost to nothing or they can actually present as New Old Stock. On close inspection this one appears to have been lightly used but well cared for. No brassing at all to the furniture, no visible marks on the plastic parts and accompanied with a very nice double hole DF nib. Even the inside of the cap appeared clean but as I threaded the cap back on to the body I encountered an annoying click. I took the cap back off and inspected the threads thinking that there might be some piece of crud attached or that I might find a gouge in the threads. Nothing. I just chalked it up to a defect and was glad that it wasn’t a crack in the cap or a scratch on the turning knob. I learned something, thanks for the information. I’m glad to have been able to shed some light on this issue. I had the same initial thoughts with my pen and was very relieved to find myself mistaken. Hopefully this post brings to light a rather obscure and limited feature that can be rather disturbing if one doesn’t know what it is. I recently received a Pelikan 400NN in near mint condition. I am SO glad I found this article before I got my pen, because otherwise i would have sent it back. When looking into the cap with a light you can see the friction ring in there. I think this is such a cool unique feature which adds to the rarity of the pen (looking back at how you stated it was only offered in 1958). It sounds like you were about to have the same experience that I did. There is nothing worse than receiving a pen that turns out to be damaged. That said, it’s also great to find out that the pen actually has a unique feature. I’m glad to have been of some assistance. That’s my whole goal for this blog. I was told of this cap retention design engineering by Pelikan from a German pen collector many years ago. I have had many instances on the 100 and 100N models when the cap has come loose in my shirt pocket causing the ink from the nib to soak in my shirt. In some. Had to throw one shirt out. The thread design was done to solve the problem I described. Thankfully, a Pelikan cap has only unscrewed in my pocked once or twice and the result was not devastating. It is definitely something that I’m aware of but not a common problem that I face. I think that this was an innovative design by Pelikan but I am not sure as to why it was so short lived. I have a 400nn on the way(coming all the way from Croatia). I’m glad you shared this cause I would have hated to think it was a defect. Pelikan sure hit the bullseye with the 140 and 400 circa 1950s. 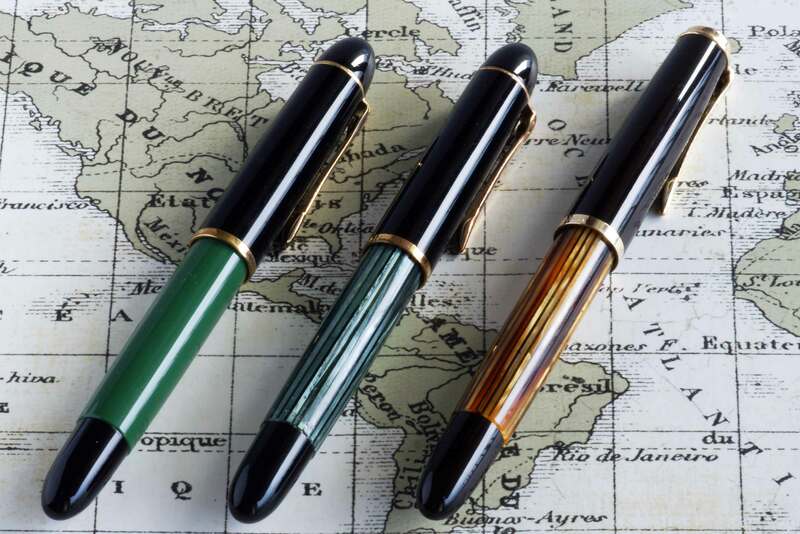 Some consider the the 1950 400nn the greatest fountain pen ever made- I can’t wait to get my hands on mine! Congrats on your new pen! I love the 400NN. Enjoy it. The only complaint I have about my Pelikan 405 is in fact the loose cap design. It’s a pen I bought new a few years ago, and it was loose from the beginning. I too have lost a couple of shirts to this pen, even though I thought it was tight when I pocketed it. I now leave the pen at home and only very rarely use it. I since have drifted off to buying the top of the Pilot line and have not reconsidered Pelikan for other purchases. The pen otherwise writes great, and as others have said, the refilling is topnotch. Is there anything that can be done to tighten the cap / body fit up? I just can’t trust it not to nail a suit again….though I have gotten good at laundering ink. The Pelikan cap is designed to be unscrewed quickly which I appreciate as it allows for quickly getting to the business of writing. I have never had one come undone in the pocket and that is the only way I carry my Pelikan pens. It should be able to be snugged to where it won’t come undone. If it was loose from the day of purchase and that was a few years ago, I’m not sure that you’d have any remedy at this point. There is a three year warranty on new purchases so you could try to contact Chartpak to see if you can find a remedy for the problem through them. It’s a shame that this keeps you from using such a nice pen.